Three beautiful children in this family, and the two youngest, both boys, were the focus of the gathering at their home. In this case I felt it was very important to include their sister in the ceremony and so we decided a sand ceremony was perfect as a part of the baptism itself. After introductions and prayers, we performed the sand ceremony, using it as a simple blessing of the spirits of each of the children. Once completed, a ritual cleansing was performed by having the children wash their hands in a bowl of blessed water and the blessing of water on the head was completed as they performed this task. This went well, as it was not as intrusive into their personal space as the ‘water on the head’ cleansing/blessing alone would have been. With three children it was imperative to maintain calm and to this end I also added some fresh lavender flowers to the water for a couple of days before straining and decanting. 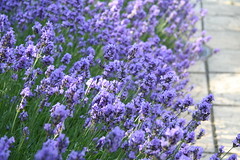 Lavender has a very soothing effect and I use it a lot with children and those who may be under stress, including animals. The children all behaved well, but the dignity shown throughout by Cami was remarkable to witness. The whole family were very welcoming and it was an absolute pleasure and honour to be included in this day when we celebrated the pure and unique spirit of each child. May your lives be blessed and abundant, Cami, Connor and Quinn! I am expecting some photos of the children once there are some available, so I will update when I can.